Come see us at our beautiful building in downtown Carnegie! 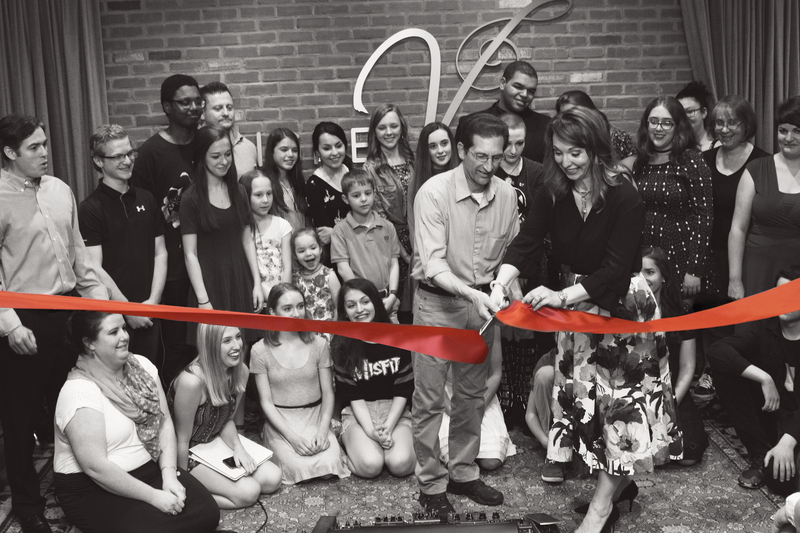 Higher Voice Studio’s grand opening was just the beginning of a triumphant first year at our new location in beautiful downtown Carnegie!! Welcoming over 140 new voice students through our doors in one year, our halls have been blessed with joy, music and new faces eager to be a part of Higher Voice Studio. Click here for a moving article by Harry Funk of Pittsburgh’s Almanac, complete with a music video memorializing our grand opening at our new building. Thank you to Jack Kobistek, former Mayor of Carnegie, for helping us cut the ribbon, to Carnegie for embracing us with open arms and to all of you for making Higher Voice Studio a success! Open Mic Night will not take place on Friday, March 8th! But don’t worry: we will resume on Friday, April 12th. Bring sheet music for Joe, bring a karaoke track (mp3) or accompany yourself! Sing something you’ve been working on with your teacher or something you’ve never done before! We are an encouraging and just excited to see you sing. What are you waiting for? Sign up below! We are happy to announce that Meghan Kuczinski, Sammy Walsh, Ila Joshi, Johnny Urso and Laasya Pedapati gave a Journey of a performance in Rock of Ages at South Fayette Middle School this month. Guitars and hair to the sky, these students really embodied the roles. Congratulations to the entire cast and crew! Congratulations to Trisha Holmes who will be performing Fiona in The Comtra Theatre’s upcoming production of Shrek, The Musical! Trisha has been spending the last few months strengthening her acting, dancing and singing skills, so she can truly be called a “triple threat.” Make sure you catch her in this family friendly show with performances on Friday, April 5th, Saturday the 6th, Friday the 12th, Saturday the 13th, Friday the 19th & Saturday the 20th. The newest list of 15 Fresh 32 Bar Audition Cuts has been released by performerstuff.com. Standing proudly alongside Idina Menzel and Liza Minelli, #6 features our own Carly DeCock with special guest Emily Mcferran in Upper St Clair High School’s production of The Drowsy Chaperone. Sure, we’re a little biased, but it is an excellent list with some new tunes you might want to use at that next audition. Enjoy! We have a FREE Masterclass scheduled at Higher Voice Studio THIS Saturday, February 9th from 2-5pm. If you haven’t attended a masterclass before, they are open to all members of Higher Voice Studio and are the BEST way to get over your nerves, meet other singers in the studio and learn a ton about singing! We got to catch up with Higher Voice Studio alum, Kate Torisky this past week. Yes, she’s graduating this spring from Saint Vincent College with a degree in Management and minors in both Operational Excellence and Chinese, but has that stopped her from performing? Oh no…… She was just cast as the lead, Phyllis, in the operetta Iolanthe with her favorite college club, the Gilbert & Sullivan Players. Congratulations to Emilie Buchanan (Featured Ensemble), Gabby Deep (Wife), Ella Elkoni (Wife), Evelyn Hertzog (Wife), Adam Levine (Brother) and Noah Levine (Brother 2 & Butler) who have all been cast in Fort Couch Middle School’s upcoming production of Joseph and the Amazing Technicolor Dreamcoat. Congratulations to the lovely and talented, Madeline Dalesio, and her scene partner, Lindy Spear, for being crowned the winner of the Upper Division Scenes category at the 25th Annual Shakespeare Monologue & Scene Contest! Only 41 actors in grades 8-12 (Upper Division) and 4-7 (Lower Division) were chosen for the Showcase of Finalists at the O’Reilly Theater from more than 1,000 students who entered the competition at the beginning of February. Congratulations Jacob Malizio (Max Detweiler), Lillie Tuck (Sister Sophia), Zachary Handelman (Herr Zeller) and Shayna Silverman (Nun) who will be performing in Mt Lebanon High School’s upcoming performance of The Sound of Music on Thursday, May 2nd (7:30pm), Friday, May 3rd (7:30pm) and Saturday, May 4th (2:30pm & 7:30pm). Noah Stiglich will be performing BOTH Judas AND John The Baptist in St. Thomas More School’s production of Godspell on Thursday, May 2nd at 7pm and Friday, May 3rd at 7pm. Check it out in this Beautiful City. Welcome to 2019, everyone! Let’s ring in the new year with a fresh Open Mic Night! This Friday, January 11th at 6:30pm is our first Open Mic Night of the year and we couldn’t be more excited! The Teacher Takedown this month is “Believer” by Imagine Dragons! We are so excited to welcome Zach to our family! If you are interested in taking guitar lessons, need help recording, or are looking to practice with guitar accompaniment, take a look at Zach‘s schedule! And be sure to say hello to him when you see him around! The Roots of Steel concert was one of the many benefit concerts for the Tree of Life Synagogue that began popping up around the city. Higher Voice Studio was honored to have been included in the lineup. Numerous names graced the program, including Billy Porter, Sara Jean Ford, Erik Cavanaugh, and Chris Jamison graced the stage. Miss Caitlin led a group of eight students from the studio in an arrangement of “Citizen/Soldier” by 3 Doors Down. Caitlin is so proud of the students for their hard work and dedication to the people of the Tree of Life. They learned their music, were professional and respectful during the entire process, and sang out with their hearts to the entire Hall during the performance. The Higher Voice Studio Annual Recital is Sunday, February 17th, 2019 from 2-5pm at Bower Hill Community Church in Mt. Lebanon with a lovely cookie and punch reception following to celebrate! The Recital Dress Rehearsal will be on Friday, February 15th with rehearsal times available between 4-9pm at Bower Hill Community Church! Friday, January 11th now marks FRZY Day! FRZY is a rapper hailing from East Liberty. He is best known for his witty tribute to the beloved Mister Rogers. FRZY, who has been in the rap game for just over a decade, released his double-disc debut album, “God King Slave,” in 2016. Recently, he was part of the WPXI Holiday Parade and A Concert for Unity: To Rebuild and Reopen Tree of Life with Dan + Shay, featuring another Higher Voice Studio student, Alana Solomon. Katie Hughes is playing Belle, and new Higher Voice Studio student, Eiley Doyle is playing Babette in Sewickley Academy’s upcoming production of Disney’s Beauty and The Beast. Performances are on February 28th, March 1st and 2nd, with all shows starting at 7pm. It was a day we will never forget. 100.7 FM Star, Y 108 FM, FRZY, Alana Solomon, The Andy Davis Band, and Dan + Shay came together this month and performed to a sold out crowd at the Byham Theater in downtown Pittsburgh, earning $50,000 to support the rebuilding and reopening of the Tree of Life Synagogue. Hear ye! Hear ye! Come join Higher Voice Studio’s owner and founder, Hilerie Klein Rensi, as she returns to Pittsburgh Festival Opera for an evening of positively Medieval enjoyment at Merry Madrigals at the Mansions! Happy Holidays! Want to celebrate with us? Our December Open Mic Night is holiday themed, so we want to hear your best carols and holiday favorites! Not only that, but our Teacher Takedown selection in “Hips Don’t Lie” by Shakira! Come on down to the studio on Friday, December 14th at 6:30pm to sing and be merry with us! We welcome Nick Kochanov to our team of expert voice instructors! His bright and engaging personality, combined with his masterful teaching and rousing rendition of Shakira’s “Hips Don’t Lie” at the final Higher Voice Studio Open Mic Night of the year, has earned him an everlasting place in our hearts and Higher Voice Studio. Casey Squires, joined our family as our Studio Administrator, aka the charming gal at the front desk with the winning smile and the answer to all of your Higher Voice Studio questions. The secret sauce of our success this year, she has proven herself immeasurably helpful while bringing creativity, resourcefulness, wit and chutzpa to our growing studio. Joe Woodring joined the Higher Voice Studio crew as our new piano instructor and resident accompanist. Students resonate with his calm confidence and fierce piano skills which he showcased month after month at our Open Mic Nights. Not only was Joe more than happy to train our singers on the keyboard, but he was instrumental to their success at The National Association of Teachers of Singing Competition this year. He accompanied our students 44 times over the course of the day, playing 36 different pieces! Seriously. What would we do without him?!? Open Mic Night is November 9th! It’s 80’s theme this month, so it’s time to bust out your sweatbands and high tops for a night of your favorite Whitney Houston and Michael Jackson numbers. As always, the doors are open from 6:00-9:00PM! Come one; come all! Saturday, November 17th marked an exciting day for Higher Voice Studio. West Virginia University hosted The Tri-State Chapter National Association of Teachers of Singing Competition, and all 10 of Hilerie’s students gave wonderful performances. Six students got to perform in the final concert in front of all of the participants and faculty, and won 8 awards spanning both the musical theater and classical genres. Yup! Some singers won for both! A round of applause to Hunter Briggs, Madelyn Chamblin, Sreya Dey, Malorie Glancy, Trisha Holmes, Audrey Logan, Milana Sacco, Sam Schuler, Ashley Teti, and Shane Treloar who all carried themselves with poise and grace both on and off the stage, supporting each other as a team every step of the way. This month, Lincoln Park showed us what it’s like to embrace the dark side in “The Addams Family.” Liam Allen was Uncle Fester, a crazy but good hearted family member intent on helping Wednesday, played by Hannah Post, end up with her one, true love. Be sure to see Ashley Teti as Sister Mary Robert, Kaylee Skumburdes as Sister Mary Patrick, Hunter Briggs as Curtis, Cora Brown, Valeria Figueroa and Abbey Evanko as featured Nuns, and Gabby Abriatis, Sheridan Molnar, Riley Thornton, and Tess Zajicek as ensemble members! The show is scheduled for March 6-9 and tickets will go on sale soon! Be sure not to miss this one! It’s that time of year! The time of year when all of the Christmas shows come around again. This month, we had the pleasure of seeing Miss Keri Radonovich in Little Lake Theater‘s production of A Christmas Story. Keri portrayed Esther Jane, one of Ralphie’s classmates. What’s better than being nominated for an Emmy? WINNING ONE!!!! Pittsburgh-based artist, guest instructor, student and lover of all things Higher Voice Studio, Harvey “FRZY” Daniels, won an Emmy Award this week for his work with WQED’s segment, titled “The Sweater Sessions.” Written in memory of Fred Rogers’ legacy and the 50th anniversary of Mister Rogers’ Neighborhood, The Sweater Sessions featured local artists performing in their own genre, giving our Pittsburgh rapper friend the green light to create something truly unforgettable. November will kickoff our busy season with open mic night on November 9th. It’s 80’s theme this month, so it’s time to bust out your sweatbands and high tops for a night of your favorite Whitney Houston and Michael Jackson numbers. As always, our is open for you from 6:30-9:30! Open Mic Night is Friday, September 14th! Open Mic Night is the perfect opportunity for our students to shine brightly and see how much they are improving. Sing a cappella, accompany yourself on guitar or piano, let Joe play for you, or bring a karaoke recording. Dayna Desantis and Sydney Krauth have released songs this week! Both Higher Voice Studio students were part of the Singer Songwriter Sessions with international recording artist FRZY last summer and are so excited to share what has been a years worth of hard work and dedication to get to this moment. Laurie Kudis spent her summer gigging around Pittsburgh including performing solo some of her original songs at Pittsburgh Piano Day in Market Square on a beautiful Steinway piano and with her band, Charm & Chain, at the extremely popular Friday’s at the Frick and at the Zelienople Amphitheater. Coming up, Laurie‘s band Charm & Chain will be opening for the Empty Pockets, one of Billboards top 15 up-and-coming bands, and who’ve been touted by Rolling Stone. The show is at Club Cafe on Monday, October 15. Do you love singing? Of course you do! Now you can sing at our open mic night! Join us on Friday, August 10th at 6:30pm in Hibbitt Hall for an evening of relaxation, sweets, and (of course) music, provided by our own Higher Voice Studio students! Ashley Mullens performed in Flat Stanley the Musical Jr. at Little Lake Theater this month. Come see one of the most beloved children books turned into a most musical adventure, starring Stanley Lambchop, your ordinary, everyday, ten year old boy who’s suddenly flattened by a bulletin board the falls on him. The tale follows him as he makes his way across the globe trying to solve his most unique problem in an effort to become three dimensional again. Catch Ashley Mullens in this awesome family friendly show before the Little Lake Theater season ends! Ashley Teti released her newest single, “Coloring Book”! Check it out! Written last summer at Higher Voice Studio, “Coloring Book” is the product of our first Singer-Songwriter Workshop with national recording artist and lover of all things Higher Voice Studio, FRZY. Geared towards students who had never written a song before or students who were ready to take their songwriting to the next level, the classes sold out in a matter of days. “Taking the Songwriting Workshop at Higher Voice Studio has completely changed my life! Getting a chance to meet & work with FRZY– a national recording artist was beyond awesome,” exclaims Ashley. Kara Rantovich held her Senior Recital this past Sunday before she heads off to the University of the Arts in Philadelphia, PA! Singing show tune favorites like “I Dreamed a Dream” from Les Misérables and “Somewhere Over the Rainbow” from The Wizard of Oz, to the one that started it all- “How Did We Come to This” from The Wild Party, Kara’s recital was certainly full of beaming talent and emotion. Her introduction piece was “Always Starting Over” from If/Then, which was very fitting considering her big move into college. Congratulations to Hunter Briggs who has been chosen out of 40 applicants to perform in October at the annual Pennsylvania School Board Association School Leadership Conference at Hershey Park. He will be singing and accompanying himself on the piano performing “Hallelujah,” by Leonard Cohen, “From Now On,” from The Greatest Showman, and a variety of other songs showcasing his talent and love of music. Harvey “FRZY” Daniels has been nominated for an Emmy for “The Sweater Sessions,” a collaboration with WQED to celebrate of the 50th anniversary of Mister Rogers Neighborhood. A tribute to the make-believe world that Mr. Rogers created all those years ago, FRZY and other Pittsburgh artists performed their own version of “Won’t You Be My Neighbor” in their own style. Take a listen here! Now you can sing at our open mic night! Join us on Friday, July 13th at 6:00pm in Hibbitt Hall for an evening of relaxation, sweets, and (of course) music! This evening will be a donation-based event, featuring snacks and beverage for purchase. Bring sheet music to your favorite song for Joe to play, a karaoke recording, guitar or feel free to accompany yourself on the piano. Come out and support your fellow musicians, and sing a tune or two! We will be live streaming- so dress to impress! Bring your family and friends to cheer you on! On Saturday, July 14th at 2:00pm in Hibbitt Hall, Hilerie will be hosting a FREE masterclass! If you haven’t attended a masterclass before, they are open to all members of Higher Voice Studio and are the BEST way to get over your nerves, meet other singers in the studio and learn a ton about singing! Joe will be here to accompany you, and those that would like to can come up, sing their music, and Hilerie will work with them in front of the other students. If you aren’t ready to sing something, just come and watch! A lot of the school students are out of school for the summer, so this is an exceptionally great opportunity for older and younger students to try it out! Pittsburgh Musical Theatre’s production of Mary Poppins at the New Hazlett Theater was a huge success! Our students, Liam Allen, Charlotte Kinslow and Amara Comans were great representatives of all the hard work of our students at the Studio. Higher Voice Studio is elated to welcome Joe Woodring as a piano teacher and accompanist. He truly enjoys working with students of all ages, abilities, and backgrounds to set and achieve their goals! Joe is a professional pianist, accompanist, and music teacher relocating to Pittsburgh from Toledo, Ohio. He has been teaching piano, directing choirs, and teaching various levels of music as well as directing musical theater productions since graduating from Bowling Green State University in 2006 with a B.A. in Music Education with a specialization in piano and choral music. Nicole Baker will be performing in Pittsburgh Musical Theater’s Xtreme Teen Broadway, an elite summer group that performs songs from newer musicals as well as pop songs. The group performs in and around the greater Pittsburgh area throughout the summer. And if that wasn’t enough, she will also be singing 2nd soprano with the Junior Mendelssohn Choir. A huge congratulations to Sydney Cawley who was one of only six chosen for the first alto section in the Mt. Lebanon Chamber Choir. Students not only have to show their vocal and musicianship skills for the audition, but also must submit written question responses to the director to be chosen for one of Mt. Lebanon High School’s most select choirs. Entering her senior year, Sydney knew that this would be her last chance to be a part of the Chamber Choir, so she prepared her audition music with her voice teacher, Holly, and prepared for the sight-singing portion of the audition with Caitlin. Tessa Savannah sang at CMA Fest this month in Nashville! Tessa began studying voice with Hilerie while in high school in New York and went on to attend Berklee College of Music in Boston, studying songwriting and voice. “I really do owe it all to Hilerie,” adds Tessa. Follow Tessa’s artist page, Tessa Victoria and Instagram @tessavictoriamusic for more! Abbey Evanko (Ariel), Reagan Redford and Clara McGough (mer-sisters) and Piper Redford (Chef Louise) were sensational in Little Lake Theater’s The Little Mermaid! “The characters these girls created were mesmerizing and you forgot you were in a theater,” says Caitlin! Bravo to the cast and crew of Fort Couch Middle School’s production of The Wizard of Oz! Including Michael Barsotti as the Scarecrow, John Hertzog as the Scarecrow, Isha Sinha as the Wicked Witch, Ammar Kethavath as the Tin Man, Bria Zegarelli as Aunt Em, Sofia Putorti as Galinda, and Zoe Dvorin, Sydney Kirk and Anoushka Sinha as Dancers. Congratulations to Liam Allen and Daniella Stephens who were both accepted into Lincoln Park Performing Arts Charter School! Both are entering the 8th grade. For auditions, Liam sang “Proud of Your Boy” from Aladdin, and Daniella sang “I Dreamed A Dream” from Les Miserables. Gene Kelly’s nominations have been announced and we couldn’t be more excited to announce that Jenna Wood was nominated for best actress, and Matty Thornton was nominated for best supporting actor from Chartiers Valley’s production of Legally Blonde! A number of our students were involved in productions that have been nominated in the Gene Kelly Awards this year, as well! Keri Radonovich will be a part of an outstanding choral education program since 1983! Pittsburgh Youth Chorus (formerly Children’s Festival Chorus) is the region’s premier choral organization for young voices. More than 200 diverse young singers throughout the Pittsburgh region come together each week to share their love of music and singing, and through their expert care and guidance, they help them find their voice! That being said, being a part of the Pittsburgh Youth Chorus is nothing short of an honor, and Keri is now a part of this esteemed choir for their 2018-2019 season! Gian Carlo Menotti’s one-act English opera, The Telephone will be performed in Hibbitt Hall at Higher Voice Studio directed by and staring Abby Mae Rogers, soprano, with Jacob Boergesson, tenor, and accompanied by Tim Heavner, piano. A huge Higher Voice Studio high five, fist bump and standing ovation for our new Studio Administrator, Casey Squires!!!! Woo hoo!!!!! Casey is a 2016 Slippery Rock University (SRU) graduate, having earned a degree in Arts Administration and Anthropology with a minor in Communications. At SRU, she acted as Production Manager for three years for the annual Brave New Plays festival and was the Publicity Manager for a number of shows and events, including the annual Kaleidoscope Arts Festival and a show SRU Theatre showcased at the Edinburgh Fringe Festival in Scotland. In her last semester of school, she interned with the Pittsburgh Symphony Orchestra in Media Relations. Since graduating, she has been doing freelance work in design and photography for events all over the world. We have put our hearts and souls into song in our beautiful Carnegie building for ONE YEAR this month! What better way to celebrate than with a party! We are so thankful to have each and every one of you as part of our family, so please come and give yourselves, your parents, your peers and your teachers a well-deserved round of applause! Join us on Sunday, April 29th, 2018 from 2:00pm-5:00pm as we congratulate everyone on their hard work this past year. Just like our Studio Debut in 2017, we’re celebrating with an open mic night, so bring your sheet music as Kevin will be at the piano, and again our doors will swing open to welcome everyone you’d like to invite to share this momentous occasion with. Happy Birthday to us, and many more to come! Boyce Middle School’s 5th graders transformed their school into the magically sugar coated world of Willy Wonka Jr. Our stars Keri Radonovich (Candy Man) and Luciana Olshanski (Mrs. Teavee) were sweet beyond measure and their teacher, Caitlin, couldn’t have been prouder. Congratulations on your fine performances ladies! We look forward to many more! Our seniors, Marcy Smith and Anneliese Wolfanger performed in their final high school productions this past week as only they could…. the stars that they are. Both ladies have spent high school traveling the two hour commute for voice lessons at Higher Voice Studio to prepare them for college majors and careers in singing. Marcy performed the role of Roxie Hart in Elk County Catholic High School’s Chicago and Anneliese was Cinderella in St. Mary’s High School’s Into The Woods. Marcy will join only 15 accepted incoming freshman majoring in Musical Theater at Temple University in Philadelphia this fall and Anneliese is currently deciding between multiple offers from the top classical voice colleges in the nation. We are now offering a Sight Singing & Ear Training class with Caitlin! Learn about rhythms, keys, intervals and chords and you will begin to read music like you read English! It can be that simple… and fun! And here’s the good news. The sooner you start, the easier it is. Chartiers Valley Middle School brought the African savannah roaring to the stage. Congratulations to Allie Cottom who was brilliant in the chorus, Zoe Carlo who played Young Nala, Mackenzie Giehll who played Banzai, and Kaylee Skumburdes who was keeping everyone on point backstage! Yet another great show from one of our favorite schools, Chartiers Valley! Hilerie’s good friend and colleague, Dr. Christopher Scott will be hosting a masterclass in Higher Voice Studio’s Hibbitt Hall on Friday, April 6th from 7-10pm. Dr. Scott serves as Assistant Professor of Music at Slippery Rock University, where he teaches a voice studio as well as other music classes. He completed his Doctor of Musical Arts degree and his Master’s before that at the University of Cincinnati’s College-Conservatory of Music. Between degree programs, Chris served Augustana College in Rock Island, IL as Artist in Residence. Marcy Smith has been cast as Roxie Hart in Elk County Catholic High School’s upcoming production of Chicago! A senior who has spent her high school years working hard, traveling 2 hours to Pittsburgh for voice lessons, practicing and keeping a positive attitude no matter what, this was a big win for her. Marcy has been incredibly busy this year doing 15 auditions for top musical theater college programs around the country, and this is the perfect way for her to cross the high school finish line. Performances are April 12-14th at 7:00pm and April 15th at 2:00pm. We only brought three students to Eastern Region NATS (the annual National Association of Teachers of Singing competition covering all of New York, Pennsylvania and New Jersey) this year hosted by West Chester University. 35 students qualified into one of the nearly 40 categories, but with musical season being as busy as it was this year, so many singers were very busy being awesome somewhere else and unfortunately weren’t able to come. Singing in NATS is such a beneficial experience. The judges are voice teachers from private studios and universities who not only score the singers, but provide written feedback about technique, presentation, diction, etc. It gets students out of their comfort zone and challenges them to really stand and deliver. They meet tons of other students and are able to participate in free classes and workshops as well. Plus, many of the teachers are faculty at top musical theater and classical voice college programs and these auditions serve as a personal introduction for students who are considering a career in voice. At the regional level, Round 1 is on Friday, Round 2 is on Saturday, the top three perform at a final concert for all of the voice faculty, singers and families on Sunday and then the winners are ranked by first, second and third. If the singer makes the top five of their category for the final round they qualify for National NATS, which will be in Las Vegas this summer. Knowing that judging can sometimes be inconsistent and that the three students that were able to come had never participated in NATS before, I didn’t really pay much mind to winning. I just wanted everyone to sing really well and enjoy themselves. But not only did ALL 3 sing GREAT at their FIRST EVER NATS, but two of them got to perform for everyone in the finals and won THIRD place in their categories in the Region!!! Way to go Emma Marshall, Jacob Boergesson and Katie Hughes! I couldn’t be prouder of all of your hard work, dedication and beautiful singing. Next year, Eastern Region NATS will be held at Nazareth College in Rochester, NY on March 15-17th. Clear your schedules now! Hilerie joins Aria412 and Pittsburgh Shakespeare in the Park at Wallace’s Whiskey Room (123 N Highland Ave, Pittsburgh, PA 15206) on April 3 to celebrate all things binding Shakespeare and song — from Bernstein’s “Tonight” (Act I of West Side Story) to Cole Porter’s “Brush Up Your Shakespeare” from almost the end of Kiss Me Kate. In between, we’ll take you through tragedies and comedies contrasting operatic and art house song sequences with short excerpts of the sonnets and plays! Truly such stuff as dreams are made on. Aria412 is Desirée Soteres and Kelly Lynch, also joined this month by Franklin Mosley, William Andrews, Matt Gillespie and delighted to be collaborating with Pittsburgh Shakespeare in the Park’s Yvonne Hudson as the vaunted Mrs Shakespeare! Don’t be like Sir Andrew from Twelfth Night wishing you had but studied the arts! The show starts at 7 p.m. and there’s no cover charge or other costs attached! Spring Music Together® Registration is OPEN!!! Do you know a little one who loves to sing? Higher Voice Studio’s Holly van Hoey will be hosting more free music classes starting this March in Hibbitt Hall for children 5 and younger and the adults who love them!!! Spread the word! Also, registration is now open for our Spring Music Together Classes that begin in April. Click the link below for more information and to sign up for all of our Music Together® offerings. Come make music with us! It’s that time of year again! Recital Time!!! We’ve just announced on our Higher Voice Studio Facebook page that the Annual Recital is going to be held at Faith Lutheran Church in Upper St Clair on Sunday, February 11th from 2-5pm. This is a very exciting afternoon in the studio and one that is anticipated all year long! We are really looking forward to hearing you all sing! We have a FREE Masterclass scheduled at Higher Voice Studio on Saturday, February 3rd from 2-5pm. If you aren’t ready to sing something, just come and watch! Priority will be given to students performing in the recital as this is a great chance to get your music out before February 11th. Allison Epler is Eva and Wyatt Keating is Che in Upper St Clair High School’s upcoming performance of the rock opera Evita by Andrew Lloyd Webber. Rounding out the cast are Malorie Glancy and Keira James (Aristocrats), Sam Dvorin (Army), Antara Cleetus, Sara Hess, and May Higginbotham (Ensemble). Evita’s narrator, Che, follows the life of Argentine political leader Eva Perón, her early life, rise to power, charity work and eventual death. Performances are March 9-10th (7:30pm), March 11th (2pm), and March 15-17th (7:30). This is your last chance to register for the Music Together Winter Session beginning this Saturday, January 13 from 9-9:45am! The class runs every Saturday morning till March 10th and is guaranteed to be one of the most fun, enriching and definitely musical days of your week. Come sing and play with us! Nick Traficante is Albert Peterson, Ellie Racunas is Rosie Alvarez, Chloe Mesogitis is Mrs. Doris MacAfee and Elise Romero is a featured dancer and ensemble member in Peters Township High School’s upcoming production of Bye, Bye Birdie. Inspired by Elvis Presley and his 1957 draft notice into the army, rock star Conrad Birdie travels to a small Ohio town to make his “farewell” television performance and kiss his biggest fan before he is drafted. Performances are March 15-17 at 7:30pm and Sunday, March 18th at 2m. Ticket sales begin February 1st. Carly DeGruttola is the Flower Girl, Paige Krupp is the Maid and Abby Solomon is Selsey Woman in Thomas Jefferson High School’s spring musical, Lerner and Loewe’s My Fair Lady. Based on the stage play Pygmalion, Eliza Doolittle, a Cockney flower girl, takes speech lessons from professor Henry Higgins, a phoneticist, so that she may pass as a lady. The musical’s 1956 Broadway production set a record for the longest run of any show on Broadway up to that time and the film starred Audrey Hepburn and Rex Harrison, featuring songs like “I Could Have Danced All Night” and “On The Street Where You Live.” Performances are Thursday March 15th at 7:30pm, Friday March 16th at 7:30pm, and Saturday March 17th at 1:00pm and 7:30pm. Ashley Teti was one of four students who headed into Studio 84 this week to begin Phase 3 of the Higher Voice Studio Singer-Songwriter Sessions with national recording artist FRZY. Recording her original song, “Coloring Book,” written this past August, Ashley got to work with industry professionals who encouraged and guided her through the process. Phase 2, the photo sessions for the Higher Voice Studio Singer-Songwriter students, was completed this fall and are in the final touch up process. Wiley Lindsey, Sydney Krauth and Dayna Desantis have all recorded their songs now at Studio 84 as Phase 3 continues, and the final group of students will have this same opportunity in the upcoming weeks. Not only is Seton LaSalle High School doing Into the Woods with Kara Rantovich as Little Red Riding Hood, but St. Mary’s Area High School is also doing Into the Woods this spring and Anneliese Wolfanger has been cast in role of Cinderella! Both ladies are very busy this year as Kara is auditioning for college musical theater programs and Anneliese is auditioning for college classical voice programs. Performances for Seton LaSalle’s production are March 1, 2 and 3 at 7:30pm and St. Mary’s Area High School performances are April 12-14 at 7:00pm. We would like to welcome Nick Kochanov, a Pittsburgh based voice teacher, actor, and singer, who has been performing regionally in musicals, operas, and theme parks for the past nine years, to Higher Voice Studio as a new Vocal Coach. Nick holds a degree in Vocal Performance from Slippery Rock University, where he was a member of the chamber singers, served as the Vice-President of the University Choir, and was a member of the honorary music fraternity, Mu Phi Epsilon. Megan Jones was able to meet her idol, Audra McDonald, after adding a brilliant High C at the end of “I Could Have Danced All Night,” after Audra asked the audience to sing along. Megan and her mother, Holly, were then asked to to meet some board members from the Rochester Philharmonic Orchestra (and Audra). Megan was also the first vocalist in years to win the Ithaca College Conservatory-wide concerto competition. She will be performing “The Bell Aria” from the opera, Lakme with full orchestra on March 3rd with the other 2 finalists. Traveling from Ithaca College, Dr. Walz will be hosting a masterclass this Sunday, December, 10th from 2-5 PM, covering everything from performing to vocal technique right here in Hibbitt Hall at Higher Voice Studio. Due to the advanced level of information, this masterclass is for singers ages 14 and up. Congratulations to Alexis Graves who has been cast as the lead Georgia, in Canon-McMillan High School’s upcoming production of Curtains, a parody of 1950s “whodunnit” theater mysteries, where a lone detective, Lieutenant Frank Cioffi, investigates a series of murders that take place place behind the scenes of a fictional 1950s cowboy musical, Robbin’ Hood. Performances are March 8-10 at 7 PM. Noah Stiglich is Captain Von Trapp at St. Thomas Moore Catholic School in Bethel Park with performances on April 26th at 1:30 PM and April 27th at 7 PM and Katie Hughes is Liesl at Sewickley Academy High School with performances on March 1-3 at 7 PM. The Hobbs Sisters have released their newest single, “Background Noise.” “We wrote the song with our friend Greg Bates and it was recorded and produced in Nashville by Greg Bates and Ben Jackson. We CANNOT wait for you to hear it ” Download it now and visit their Facebook page for more! Jenna Wood (Elle Woods), Ashley Teti (Margot), Matty Thornton (Callahan), Kaylee Skumburdes (Paulette), Hunter Briggs (Aaron & Featured Soloist), Katherine Palma (Chutney & Featured Soloist), Taylor Bopp (Featured Soloist), Abbey Evanko (Featured Soloist), Alley Gamble (Featured Soloist), Lena Werner (Featured Soloist), Gabby Abriatis (Ensemble), Cora Brown (Ensemble), Sheridan Molnar (Ensemble), Madison Mulligan (Ensemble), Hannah Salerno (Ensemble) and Riley Thornton (Ensemble) are performing in Chartiers Valley’s upcoming performance of Legally Blonde The Musical! Performances are March 7th, 8th, 9th and 10th at 7:30 PM and tickets are available here. Emily Maloney (senior) will be performing Dolly, Sam Schuler (junior) will be singing Cornelius Hackl, and Audrey Logan (freshman) and Ariel Cameroe (freshman) are double cast as Irene Molloy in South Fayette High School’s spring production of Hello, Dolly! Performances are Friday, March 23rd at 7:00 PM, Saturday, March 24th at 7:00 PM, and Sunday, March 25th at 2:30 PM. Clara McGough can be seen as Charlotte in Little Lake Theater’s upcoming production of Yes, Virginia there is a Santa Claus, The Musical on Nov 24th & 25, December 2nd & 3rd, 9th & 10th, and 16th & 17th. Tickets are available here. Kevin Milliken will be playing piano for “Christmas Through The Years” at the Edwin S Porter Theatre in Connellsville, PA on Friday, December 1st at 7:30 PM, Saturday, December 2nd at 7:30 PM and Sunday, December 3rd at 2:30 PM. Tickets are $10 and are available by reservation and at the door. Hilerie will join members of the Pittsburgh Youth Philharmonic Strings as they play along with Jazz legend Richie Cole for “A Very Carnegie Christmas” at the Carnegie Music Hall, up on the hill behind Higher Voice Studio on Saturday, December 2nd at 7:30 PM. Buy your tickets here. Higher Voice Studio’s Annual Cookies and Caroling is on December 2nd starting with the Carnegie Tree Lighting at 5:00 PM in the parking lot next to PNC Bank. From there, we’ll move our celebrations to Higher Voice Studio for cookies, hot chocolate and cider and then we will head out to spread our Holiday cheer with the music we all know and love. Bring your favorite cookies and your warmest coats. Invite your friends, parents, grandparents and second cousins twice removed! All are welcomed and ALL MUST SING!!!! Kevin Milliken will be performing at the Sixth Annual Holiday Show, ” ‘Tis the Season for Red, Green, and Blues” on Sunday, December 3rd starting at 6:00 PM at the Cabaret at Theater Square featuring Jason Kendall and his band and a variety of Pittsburgh’s finest musicians and performers. A portion of the proceeds from this show benefits the Greater Pittsburgh Community Food Bank and tickets are available through the Pittsburgh Cultural Trust. The Hobbs Sisters will be playing accoustic guitar and singing at “Thanksgiving Eve With The Stickers.” on November 22nd from 8-11 PM at Tequila Cowboy, on the North Shore in Pittsburgh. For all of the Hobbs Sister’s tour dates, see their website and Facebook page. Marcy Smith heads to Interlochen Center for the Arts for her first summer as a musical theater major. Pittsburgh’s rapper FRZY has been very busy taking lessons in the studio as part of his recovery from throat surgery. Stay tuned to his website because…. big news is coming! Continuing their THSPLAYITLOUD summer campaign, The Hobbs Sisters performed at the legendary Bluebird Cafe in Nashville, TN. They were also seen and heard at Seven Springs Ribfest, Shippensburg Fair and Rivers Casino Outdoor Concert with the one and only Chris Higbee. Tickets are on sale now for The Champaign County Fair with the Charlie Daniels Band on August 4th. Do not miss it y’all! Charm & Chain performed at the Deutschtown Music Festival and on August 12th will be at the James Street Gatropub and Speakeasy. Sean Michael Plumb performed the role of Dandini in the classic Jean-Pierre Ponnelle Cenerentola opera production at Bayerische Staatsoper in Munich, Germany. ​The Hobbs Sisters spent most of June in Nashville performing and writing more songs than they know what to do with. Tennessee highlights include Jack Daniel’s Saloon at Opryland and Commodore Grille… and they aren’t done yet! A little blue bird told me something big about July…..
Watch Abbey Evanko perform the national anthem at the Collier Municipal Memorial Day celebration. Josh Lyda and Ariel Cameroe are busy in rehearsals for Little Lake Theater’s upcoming production of School House Rock. See their website for ticket information. Alana Solomon is back from her first year at Belmont University in Nashville majoring in commercial voice with an emphasis in music business. Higher Voice Studio is now offering classes for the summer and fall in our new building! Click the link above to see all of the new things you can learn! Matty Thornton played Claude in Pittsburgh Musical Theater’s recent production of Hair. So much incredible singing, so much dancing and so much HAIR!!! The Gene Kelly Nominations are in! Congratulations Chelsea Calfo (Best Actress) for Reno Sweeney in CAPA’s Anything Goes, Devin Moore (Best Actor) for Sweeney Todd & Jenna Wood (Best Supporting Actress) for Beggar Woman in Chartiers Valley High School’s Sweeney Todd. Carly DeCock performed her final role- Molly in Peter and The Starcatcher- as an apprentice at Little Lake Theater. Watch her video about the performance here. Ariel Cameroe will be a featured performer in Little Lake’s upcoming production of School House Rock. Stay tuned to our Facebook page for upcoming performance dates. Emily Maloney did a fantastic job in South Fayette High School’s production of Mary Poppins and Sarah Logan wowed everyone with her Jane Banks! Peters High School’s production of Les Miserables was extraordinary. Such commitment, talent, passion and energy. Of course, Chloe Mesogitis blew Eponine out of the water! And who couldn’t stop watching Nicholas Traficante (Bishop), Ellie Racunas (Grantaire) and Gabrielle Hollander (Ensemble)? Easily, one of the best musicals I’ve ever seen a high school do. Anneliese Wolfanger put her soprano chops aside as Ursula in Elk County’s production of The Little Mermaid. Yes, some sopranos can belt low as well as they can sing high! Yay Kara Rantovich! We thoroughly agree! “Probably the most outstanding performance was of Darlene Love, the narrator, who stole the show whenever she was on stage. With a voice that would be complemented by the rhythm of any time period, she belted out every song she sang, making it impossible not to want to get up and dance along.” Read the full Pittsburgh Post Gazette article here. SO proud of Riley Thornton’s portrayal of the title role in Chartiers Valley Middle School’s production of Cinderella last night! Such grace and beautiful singing! Also, a huge shout out to Cora Gibson (Stepsister), Gabrielle Abriatis (Stepmother) and Kate Pipilo (Maiden 1) Terrific job ladies! Higher Voice Studio’s singers Carly DeGrutolla, Dana DeSantis, Paige Krupp and Abby Solomon filled the stage of TJ High School’s production of Shrek! Upper St. Clair High School has announced the cast lists for their upcoming production of The Drowsy Chaperone! And all of our leads are on the SAME NIGHTS!!! Emily McFerran is Janet Van De Graaf, Wyatt Keating is Robert Martin, Carly DeCock is The Drowsy Chaperone and Allison Epler will be the fearlessly leading the dancers as their captain! Performances are Friday, March 3rd, Saturday, March 4th and Friday, March 10th all at 7:30p.m. IT’S GOING TO BE AMAZING!!!!!! Laurie Kudis is currently in the studio with her band Charm & Chain recording a new album! Exciting things are in the works! Higher Voice Studio’s 2017 Recital was a success from beginning to end. The singers ranged from 7 to 60+ and featured classical, musical theater, rock, country and even that catchy song from Moana! For performances, check out our Facebook page. Our fearless leader, Hilerie Klein Rensi, will be stretching her Sondheim muscles in Side By Side By Sondheim the first weekend of March with Resonance Works | Pittsburgh. Get your tickets now!!!! Emily Palma and her dad, Marty Palma will be featured extras in the Netflix original series Mindhunter starring Hamilton‘s Jonathan Groff. The show is slated to premier in October 2017. We are ready to announce Higher Voice Studio’s 2017 Recital! Sunday, February 12th from 2-5p.m. at Faith Lutheran Church in Upper St Clair, PA we celebrate talent, hard work, dedication, bravery and friendship at our Annual Higher Voice Studio Recital. It’s completely free to the public and we would love to see you there! There will also be cookies and punch following…. and who can say “no” to cookies and punch?!?! Audrey Logan will be performing Belle in South Fayette Middle School’s production of Beauty and the Beast. Performances are Thursday, February 23rd at 7 p.m., Friday, February 24th at 7 p.m. and Saturday, February 25th at 2 p.m. This is Audrey’s third lead role at the middle school and this girl just gets better and better! Here is her performance of Whitney Houston’s “The Greatest Love Of All” at her school assembly last year…. in 7th grade…. at 12 years old. Riley Thornton will be performing the role of Cinderella in Chartiers Valley Middle School’s upcoming production of Rodgers and Hammerstein’s Cinderella! Joining her on stage is Kate Pipilo as Maiden 1 and Erica Everett in the ensemble. Performances are Thursday, April 6th at 7:30, Friday, April 7th at 7:30 and Saturday, April 8th at 7:30. Tickets go on sale here, February 5th! Eight weeks of competition ended with Higher Voice Studio’s John Ladik Jr. winning the 2016 Linden Grove Nightclub Karaoke Competition singing “I’m Already There” by Lone Star. What a night! ​Higher Voice Studio’s students swept the recent auditions for Chartiers Valley High School’s upcoming production of Stephen Sondheim’s Sweeney Todd. Devin Moore- Sweeney Todd, Delaney Molnar- Johanna, Nick Kletzli- Anthony Hope, Hunter Briggs- Tobias Ragg, Charlie Kovach- Jonas Fogg, Jenna Wood- Beggar Woman/Lucy Todd. And the incredibly talented ensemble performers- Sheridan Molnar, Madison Mulligan, Katherine Palma, Hannah Salerno, Hannah Thornton and Lena Werner. If it’s half as good as last year’s Gene Kelly Award-winning production of Les Miserables, then this will be a show NOT to miss! Performances are March 8-11 at 7:30 p.m. See the link for tickets! ​When Alex Barcic isn’t practicing for his voice lesson with Higher Voice Studio’s Evan Dean, he’s playing 1st chair guitar in Pennsylvania Music Educator’s Association (PMMEA) Jazz Band and winning the Guitar Sessions Scholarship to attend Berklee College of Music in the Fall. Listen to his video submission here and let the music take you away…. Make sure to get your tickets for Seton LaSalle’s upcoming production of Leader Of The Pack! This jukebox musical stars Higher Voice Studio’s Kara Rantovich as Darlene Love and celebrates the doo-wop sounds of the 60’s. Performances are Thursday, March 23rd, Friday, March 24th and Saturday, March 25th at 7:30p.m. Congratulations to all our PMEA District Chorus singers! District 1- Carly DeCock- 1st Chair, Soprano 2, Adriane Slater- 2nd Chair, Soprano 2, Alexis Graves, 1st Chair, Alto 1, Wyatt Keating- 14th Chair, Tenor 2. District 2- Anneliese Wolfanger- 1st Chair, Soprano 1, Marcy Smith- 6th Chair, Alto 1. All the students qualify to move on to Regions! Anneliese Wolfanger also earned a District Full Concert Solo for her performance of “La Separazione” by Rossini and Marcy Smith earned a Full Song Banquet Solo for her performance of “Mister Snow” from Carousel by Rodgers and Hammerstein. Bravi Tutti! ​​​Emily Palma blew Adelaide out of the water this past summer in CCAC’s production of Guys & Dolls and now is looking to add a theater minor to her current college pursuits. Matty Thornton (The Baker), Hunter Briggs (Jack), Delaney Molnar (The Baker’s Wife), Lena Werner (Narrator), Nick Kletzli (Cinderella’s Prince), Charlie Kovach (Rapunzel’s Prince) and Hannah Thornton (Rapunzel) starred in Chartiers Valley High School’s production of Into The Woods on November 12th. What a show! ​Wyatt Keating will be performing the role of Eugene Grant in Upper St Clair High School’s production of Look Homeward Angel ​by Ketti Frings based on the novel by Thomas Wolfe. Performances are October 26,27,29 at 7:30 and October 30 at 2:00. ​Sean Michael Plumb has just won the The Metropolitan Opera National Council Auditions and will be spending the 2016-2017 season as a principal singer “festing” at the Bayerische Staatsoper Munich. Season highlights include Dandini in ‘La Cenerentola’, Harlekin in ‘Ariadne auf Naxos’, Morales in ‘Carmen’, and many more! Not only did all four Higher Voice Studio student’s place in the semi-finals of the NATS (National Association of Teachers of Singing) Regional Competition this spring, but Emily Maloney was ranked top 5 in the Freshman & Sophomore Musical Theater Women Division, Hunter Briggs won 3rd place in the Freshman & Sophomore Musical Theater Men Division, and Anneliese Wolfanger won 2nd place in the Freshman & Sophomore Classical Women Division. Congratulations to ALL!!!! Congratulations to Hannah Thornton (Eponine), Devin Moore (Jean Valjean), Matty Thornton (Javert), Alec Kinslow (Marius), Hunter Briggs (Grantaire & Laborer) Allie Nomides (Gavroche), Katherine Palma (Featured Solist), Lena Werner, Rebecca Barton, and their friends and family that contributed to a wonderful production of Les Miserables at Chartiers Valley High School. Congratulations to Katie Zemaitis! Joining the ranks of Pittsburgh talented Jackie Evancho and Chris Jamison, Katie has made it to the final round of Kean Quest on April 1st. Upper St Clair High School just finished their final weekend of Irving Berlin’s White Christmas featuring Carly DeCock (Betty), Mariya Savinov (Martha), Wyatt Keating (Snoring Man), Allison Epler (Dancer) and Emily McFerran (Lead Dancer). Jared Campbell’s newest release Meet The Future is now available on iTunes and The Blue Project, an interactive live performance geared toward middle school and high school students, is touring all across the East and Midwest. His message focuses on overcoming obstacles, anti-bullying, respect, leadership and having an amazing outlook on life. To book him for your next event or school assembly, contact him at jared@jaredcampbell.com, or visit his websites at www.jaredcampbell.com or The Blue Project. Julia Wodarek performed the role of Wendy in St. Gabriel’s recent production of Peter Pan. 12 year old Audrey Logan was featured as the lead role of Rosie Alvarez in Bye Bye Birdie at South Fayette Middle School this past spring. Enjoy her National Anthem at the Washington Wild Things baseball game here and her most recent performance of The Greatest Love of All. Chloe Mesogitis will be making her Carnegie Hall debut in NYC soloing with Acapella Adrenalin under the direction of Deek Sharon from the movie Pitch Perfect. Congratulations to Adriane Slater for her role as Niki Harris in Bethel Park High School’s production of Curtains. You can see Megan Jones this weekend at Ithaca College performing in a Sondheim review titled Alex’s Capstone: Sondheim on Sondheim. One of Laurie Kudis’ original songs “Hunter” from her release Heliacal Rose was featured this week on the Women of Substance podcast! Use this link to download the show and vote to keep the song in rotation. Visit Charm and Chain‘s website to stay up to date on their many upcoming gigs. Congratulations to Alana Solomon who will be attending Belmont University this fall majoring in commercial music. Subscribe to her Youtube channel here. The Hobbs Sisters bring a killer combination of big voices, twin sister harmonies and high energy performance to the stage. Whether headlining shows in the Pittsburgh tri-state area or opening for national acts such as Lady Antebellum, Brett Eldredge, The Swon Brothers and more, they are making a name for themselves as both singers and entertainers. From their harmony-driven original songs to their unique interpretations of popular country covers, The Hobbs Sisters have created a sound that is all their own. Their debut EP is available on iTunes and on their website. Their brand new song, “Cover Up” has also been nominated for NSAI’s Top 40 List! Cast your vote here and give them 5 stars! Johnny Luoma received his first SAG contract as a featured extra (Hospital Caroler) in the holiday movie Love The Coopers and he has been very busy touring as Douglas in Pittsburgh CLO Academy’s Gallery of Heroes Tour- The Incredibly Innovative Innovators of Pittsburgh. If you have not yet checked out B. Mattie’s cover of Justin Bieber’s “Sorry” be sure to and share it if you like it! Visit his websitefor up to date performance dates. Congratulations to Maria Long (1st Chair, Soprano 1, Pennsylvania Music Educators Association (PMEA) Districts), Carly DeCock (1st Chair, Soprano 2, PMEA Districts) and Mariya Savinov (1st Chair, Alto 1, PMEA Districts). Johnny Only is busy performing his weekly preschool music program every Wednesday morning at 10:00AM at Highland Park in Endicott, NY. To purchase CD’s and T-shirts, and for upcoming gigs see his website or find him on Facebook! When Lana Kipp isn’t busy conducting the Chartiers Valley Middle and High School Choruses, she is leading the soprano section of the Pittsburgh Concert Chorale. Tessa Victoria has just won the Nashville Rising Star Preliminary Competition and will be returning to the Wild Wing Cafe on October 26, 2016 in Nashville for the semi-finals. She has been steadily performing since her graduation from Berklee College of Music and debuted at the The Bitter End, the oldest Rock and Roll club in NYC , this past May and The Bluebird Cafe in Nashville in January. Check her out on Youtube and follow her on Facebook for the most up to date performance dates. Watch out for this up and coming performer, both she and her music are a force to be reckoned with! Chelsea Calfo will be covering the role of Maria at Pittsburgh CAPA High School this April and playing a Jet girl. Kara Rantovich is part of the Seton-LaSalle Trebles who are on their way to the National Semi-Finals at The Varsity Vocals International Championship of High School Acapella Competition. Also, she is going to be playing the lead role of Lola in this year’s school musical Barry Manilow’s Copacabana.